We want families to have control over the services we provide to empower them to make positive and sustainable changes in their lives. We work in partnership with each family to measure how our support impacts their lives in six key areas. 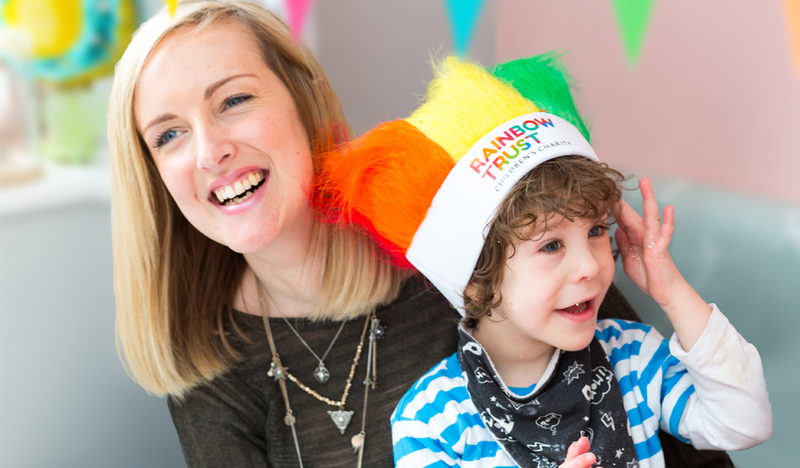 Families have identified the areas where they feel Rainbow Trust support can make the most difference. For example, if a family requests help with transport to hospital it could be because they are struggling to meet the cost of this (our intervention would lead to improved economic wellbeing), or it could be because the family finds the experience of having a seriously ill child overwhelming (our intervention could be linked to increased stability and confidence). We create a support plan based on what each family tells us they need. Two-and-a-half-year-old Daniel was diagnosed with a rare cancer just days after Claire, his mum, found out she was pregnant with his sister. Sabrina, their Family Support Worker, helped with hospital appointments and would sit with Daniel to give his parents a break from the ward. Grace was diagnosed with a brain tumour when she was 18 months old. The financial strain of having a child in hospital many miles away from home was crippling as her parents paid for transport to and from appointments. “Rainbow Trust helped us navigate the hospital experience which made a real difference when I was there on my own with Grace. Leanne’s support with hospital trips meant we didn’t have to spend hundreds of pounds we didn’t have on getting her to her treatment,” said Fiona, Grace’s mum. Noel, four, has severe development delay following a brain injury at birth and is on constant oxygen. His condition has affected the whole family and, while his parents have done their best to give all three of their children what they need, it is often impossible to spread the attention when Noel requires round the clock care and as a result the families quality of life has suffered. With Brodie, their Family Support Worker’s support, the family can relax and enjoy being together and have some fun, as there is enough attention to go round. “The first thing Alexander asks on a Tuesday morning is whether Brodie is coming. It gives the kids a break, some attention because a lot of the time is spent around Noel because of his disabilities. Even on fun days out it revolves round Noel,” said Darren, Noel’s dad. Hope has Ebstein Anomaly. The right side of her heart is severely deformed so the left side of her heart has to work twice as hard to keep pumping oxygenated blood around her body. Family Support Worker, Eleanor, supports the family at home and takes them to hospital appointments which means mum, Leanne, can focus on Hope. Eleanor can also look after Hope’s brother, Tyler, at times which is a great relief for Leanne. Megan was 12 when Adam, her eight-year-old brother, was diagnosed with a brain and spinal cancer. Clare, their mum, naturally focused on getting Adam to hospital appointments for treatment and Megan had to move in with her grandparents while Clare was in hospital with Adam. This separation left Megan feeling isolated, not wanting to speak to her mum and burden her with any more worry. Sibling Support Worker, Callie, helped Megan feel as if she wasn’t alone. She gave Megan an outlet. She liaised with her school on Clare’s behalf and helped Megan see her friends outside school. When one of Marie’s five-year-old twin sons died from an aggressive brain tumour, her family’s life was turned upside own. Dawn, their Family Support Worker, spent time with Liam, Jack's brother making sure he understood what was happening. Dawn could see that Marie was finding life difficult.